London College of Fashion has been a pivotal education hub for several footwear designers over the years, alumni include Sophia Webster, Jimmy Choo, Charlotte Olympia and Nicholas Kirkwood to name a few. 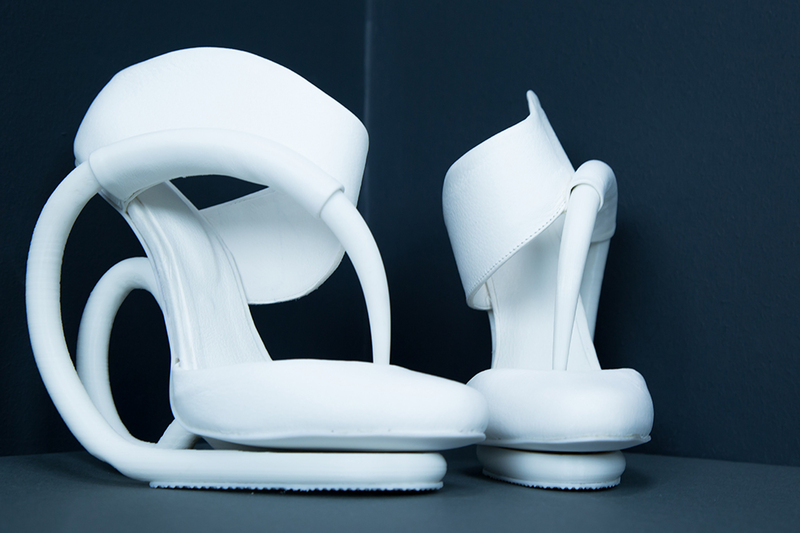 LCF News has been speaking to MA Footwear designers who’ll are graduating from this year’s cohort and hoping to follow in the footsteps of some of our most recognised alumni. Next up on LCFMA16 Graduate Spotlight is Sophia Salem, who used 3D printing to create her final collection. MA Footwear designer Sophia Salem, Photography by Giovanni Martins. I did my A levels at Bromsgrove Boarding School, where I studied art, textiles, graphics and business. This was where I first found my love for footwear design in a project about links in art. I then followed this up by studying BA Fashion Footwear at Northampton University where I got a First Class Honours Degree. I wanted to pursue my passion for 3D printing and handmade footwear after my BA and felt I only briefly touched on the subject in my undergraduate. I wanted to explore deeper research and create wearable 3D printed footwear with hand made techniques. I wanted to learn more about myself as a designer, and possibly open my own business following my postgraduate. Having experience from a prestigious university like LCF will help me grow my business. Every part of my MA was challenging, each process made me question my why way of thinking. I was made to question my ideas, but it also brought out the best in my work, and it also helped develop my personal style as a designer. I learnt a lot from Eelko, my tutor, he pushed me in all the right directions throughout my postgraduate. My MA was very much independently driven, it took me a while to get use to it, but it helped me develop my personal style. While developing my individuality, I began to work with leather which was a nice change from my BA. The whole thing was very computer based, so I started connecting my ideas with 3D printing and aspects of my project started falling into place. My usual design process revolved around drawing, drawing and drawing – working with computers helped visualise my ideas in 3D. Once the mock ups were done, I felt that I really knew what direction I wanted to take. I presented in front of my tutor and Georgina Goodman which was really insightful, they both gave great ideas about how to tweak my collection at that stage. The last three months were very challenging because it was all about making the collection – I felt this wasn’t my strongest skill. But by the time the collection was near the end, I managed to solve all my problems and became a great designer because of what I learnt from my postgraduate. I would say unconventional, messy, relatable, organic and natural. It is the best and most well-known university to have on your CV! It has the most experienced and creative tutors, and students have some of the best possibilities after graduating. That’s why I wanted to study at LCF! Studying an MA without a doubt helped me pin point and develop myself as a designer, and develop my own style at the same time. Its helped me express creativity to the fullest, LCF really pushes creativity compared to other university, others don’t really concentrate on it. I really gained a lot from my MA, I wouldn’t have ever pushed myself like I have with this course. I look at my collection and can’t believe I created it! What are your plans after graduation, has studying MA Fashion Footwear helped you realise what/where you want to be doing? Yes, its defiantly helped me decide how important it is to do what you love as I put my all into this MA. You need to be doing something your passion about at the end of the day, you’ll realise this when your working the hardest you’ve ever worked or struggling during the worst times, you need to be passion about that subject and industry. After graduation I’d like to get more experience in the industry before going back to the Middle-East to start my own line. I think the best advice is to push yourself through the whole process. You should only throw yourself into an MA if footwear is something you really are passionate about because its not easy. I defiantly think LCF is the best place for postgraduate level, I don’t know about the other courses but our MA Footwear tutor really enabled us to run with creativity and push our ideas. Not only being creative but to also relate to the industry and the trends working outside of LCF at the time. Studying an MA at LCF was the best choice of my life!